With the gate meeting in front of the Maruti Suzuki main gate in Manesar in the afternoon at 3pm today, we the Maruti Suzuki Workers Union (MSWU) have reclaimed after two years, what has been rightfully ours. Over 3000 workers attended the gate meeting which was addressed by the new MSWU Union body, including President Pawan Kumar and General Secretary Sanjay Kumar, along with the workers and Union body members from Suzuki Powertrain India Employees Union (SPIEU) and Suzuki Motorcycles India Employees Union (SMIEU). A wave of energy declared that we have ended the regime of fear that was thrust upon us workers by the owners and managers and administrators. With the election and re-formation of our Union on April 4th, today’s meeting is an open declaration of our untiring will to fight against exploitation-repression for all workers. We have won 11 of 12 seats against the management installed puppet panel in the Union elections on April 4th, with a margin of 80% for most members. Comrade Ramniwas of the Provisional Working Committee of MSWU said that “this victory validates our long continuous untiring struggle of more than two years, against the exploitation-repression by the combined might of the company management-state administration-police and all its tentacles.” This win comes in the wake of not only our long struggle since 4th June 2011 to establish our Union rights and collective power, but also after the unfazed struggle of terminated and jailed workers since 18th July 2012. Since that date, it has been more than 20months, that 147 workers including our entire Union body continue to be in jail, without any bail, in the most severest travesty of justice in the criminal justice system in India. 546 permanent and over 1800 contract workers continue to be terminated from our services even while the legal cases goes on endlessly. The company maliks and managers and the sarkari babus and netas and the entire ruling elite have nakedly united to ‘teach workers a lesson’ for demanding our just rights and for asserting our collective will. Even the courts have punished us for supposedly ‘adversely affecting foreign direct investment’. We only demanded and continue to demand our dignity as workers, our right to form a Union, and the right of contract workers who are worst faced in the situation. In the last two years, we have continued to demand justice and immediate release of all arrested workers and reinstatement of all terminated workers, and a tripartite negotiation to resolve the issue. We only dared to be united to demand this. For this elections that was due this year, after we formed Maruti Suzuki Workers Union in March 2012 (registration no.1923), the management tried all means to coerce us and install its own puppet Union. It engaged in all manners of conspiracy to divide the workers along lines of permanent and contract, along regions, along various plants, and so on. After it terminated the services if over 2300 workers in July 2012, it hired new workers who were made to toe its line and work in an atmosphere of fear and punishment. They were not allowed to even talk to the terminated workers who were leading the struggle, or even to independent and other trade unions in the area. Recently the management hired 250 new recruits from the Gurgaon plant who they thought would act in their favour, in order to pitch them against the Manesar workers. It tried to disenfranchise the jailed and terminated workers against what is laid down in our Union Constitution, and the pliant labour department had followed suit. It put the police to its use to pick up any worker who would dare to even distribute a parcha. And it propped up candidates for elections who were close to them in one panel and coerced workers to vote for them. Even against these policies of divide and rule, of repression and threats, we have emerged victorious. With the active support and solidarity of jailed and terminated workers, the struggling workers who stood against the management panel won 11 out of 12 seats. The evening of 4th April was a spirit of recapturing of the factory for workers, as the street in front erupted with celebrations after two years. Workers from inside the plant came with food of the factory canteen for the terminated workers saying that it won’t be long before their struggle also is a win and all arrested workers are also released. An unprecedented solidarity of workers to the cause of struggle of the last 3 years has made this possible. Solidarity of the workers and Union body of Suzuki Powertrain India Employees Union and Suzuki Motorcycles India Employees Union must especially be mentioned and welcomed, which opens up yet again the possibility of united action by workers in the belt. 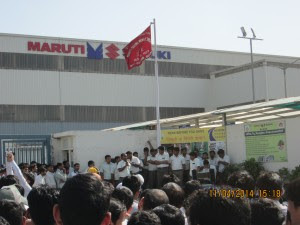 Union members from nearby Suzuki Powertrain had sent a clear warning to its management against any use of unfair practices in the elections in Maruti Suzuki, on the event of which they would even go for strike. In today’s gate meeting Comrade Anil, President of SPIEU reiterated this unity. Comrade Anil Kumar, president of SMIEU also stressed on strengthening this unity, and making it the unity of workers in the entire industrial belt of Gurgaon-Manesar-Dharuhera-Bawal. Our struggle has entered a new phase with this victory. It’s a validation of our continuing struggle not only for workers at Maruti Suzuki but for all workers here and everywhere who struggle everyday against exploitation-repression for their Union rights and collective power and dignity. Inquilab Zindabad ! Working Class Unity Long Live!